STOCKTON, Calif. (CN) –With California trudging ahead with a contentious $16.7 billion water project, a cache of environmental and social concerns remain around its plan to replumb the source of drinking water for an estimated 25 million residents. Backed by the state’s largest urban and agricultural water suppliers, outgoing Gov. Jerry Brown wants to build two massive 30-mile-long tunnels and funnel water from California’s largest river directly to farms and cities to the south. Supporters say the tunnels, now called the California WaterFix, are a vital retrofit of the state’s outdated water infrastructure and protect against future sea-level rise and earthquakes. Some environmentalists have hopped on board, but many of California’s and the country’s most influential advocacy groups are opposed. They are adamant that depriving the Sacramento-San Joaquin River Delta of even more river water could be the final blow for an ecosystem already beset by poor water quality and declining salmon populations. On top of ecological worries, local politicians and environmental justice groups feel that the WaterFix will have a far-reaching impact on disadvantaged communities already struggling in one of California’s poorest economic regions. The report by Restore the Delta warns that the mammoth public works project will disproportionately harm minority residents and poorer communities in Stockton; one of the state’s most economically distressed major cities. The grassroots group hopes the report sheds light on the environmental concerns of “those who will be harmed most by the tunnels” and that it will influence future project decisions. If built, the authors believe the tunnels would degrade water quality in cities like Stockton and Antioch, increase noise and air pollution levels during the minimum 15-year construction phase and generally make the region less desirable. Brown hopes to start construction before leaving office in January 2019, but the state is still securing funding, permits and fighting a slew of environmental lawsuits. Mega-utility Metropolitan Water District and other suppliers are expected to pick up most of the project cost, which is expected to soar above $20 billion upon completion. With over 60,000 members, Stockton-based Restore the Delta claims the state has “blatantly disregarded” environmental justice communities during the tunnels’ decades-long planning process. “Water quality impacts from construction and operation of the tunnels project would be environmental blunt trauma to sustaining a region on the threshold of recovery and prosperity, if water quality in the delta and underground water sources cannot be protected and improved,” the 96-page report states. Before flowing to the San Francisco Bay, the state’s main rivers –the Sacramento and San Joaquin- mesh together to form the West Coast’s largest remaining estuary. With over 1,100 miles of waterways and dozens of levees and islands, the delta region is one of the world’s most productive farming regions. Located about 60 miles east of San Francisco, the delta is also the hub of California’s state and federal water systems. With five total rivers draining into the delta, the area is a natural water bank and now provides drinking water to most of the state. The delta has long-been one of the Golden State’s most diverse regions, attracting people from around the world. Countless generations of Native American tribes have fished for salmon and farmed the triangular region, Chinese immigrants settled during the Gold Rush and large amounts of African Americans moved to delta towns during the Jim Crow-era. Today, vibrant Latino and Asian Pacific American communities also exist up and down the delta region. Assembly member Susan Eggman, D-Stockton, says the collection of cultures and races largely chose the delta for its clean water and healthy ecosystem. The California native is against the WaterFix and pushed for a 2017 state audit which blasted the state for skyrocketing project costs and poor oversight. “We would not only be upsetting the environment itself, but we would be upsetting the history of all the people who have made it their home for so long,” Eggman said of the project’s potential impact Monday. Stockton’s 28-year-old mayor Michael Tubbs agrees with Eggman and calls the WaterFix a “bad deal” for his city. After filing for municipal bankruptcy in 2012, the Stockton area has posted four straight years of over 3 percent job growth and Tubbs says the future of Stockton’s success depends on protecting delta water quality. “For California to be a Golden State, to be site of the resistance, to be a beacon, it has to be the Golden State for all,” Tubbs said. 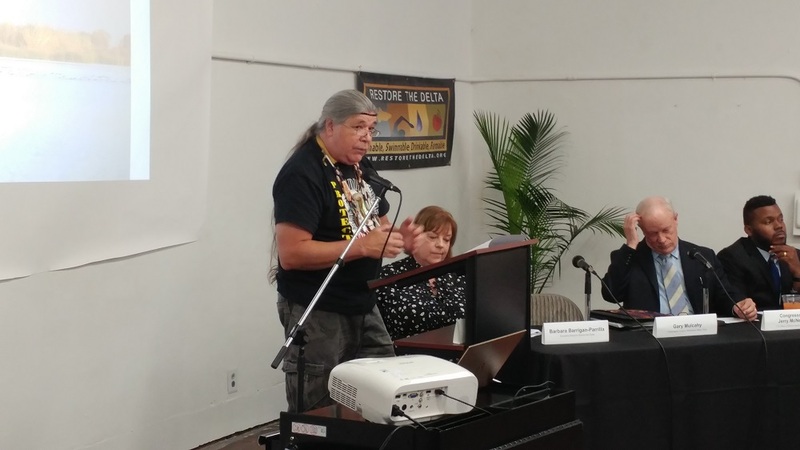 Gary Mulcahy, government liaison for the Winnemem Wintu Tribe, told the crowd that the department has never approached his tribe or others regarding the WaterFix. 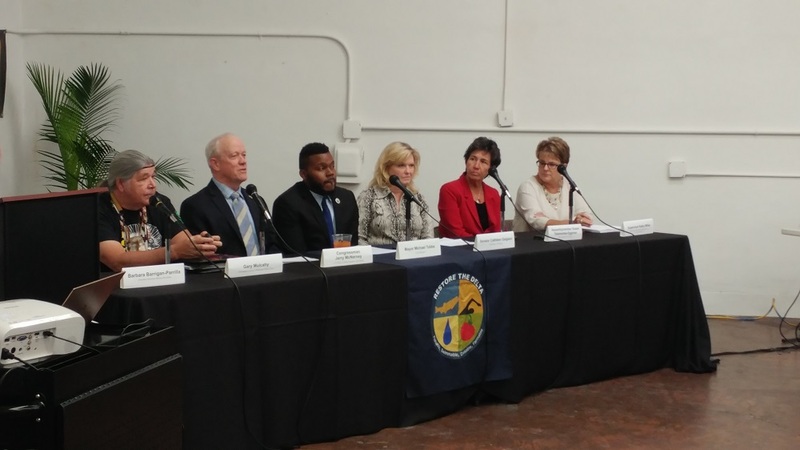 “The California WaterFix is a continuation of injustice against disadvantaged communities and native communities all up and down the state,” Mulcahy said.